Can I Clean Gold With Hydrochloric Acid? What Happens When You Put Gold in Muriatic Acid? Gold is probably the most treasured of the so-called precious metals, having been used in art and jewelry for centuries and more recently finding applications in medicine, coins and elsewhere. Muriatic acid, better known today as hydrochloric acid, is a simple, corrosive liquid with well-studied chemical properties. When gold is subjected to treatment with muriatic acid alone, nothing happens. But when \muriatic acid is combined with nitric acid to treat gold, the gold dissolves. You may ask: Why would anyone want to do this? The chemical formula for muriatic acid is HCl, and that for nitric acid HNO3. Each of these can donate a hydrogen atom, or proton, carrying a positive charge. In the case of muriatic acid, this leaves a chloride ion, Cl-; in the case of nitric acid a nitrate ion remains and has the formula NO3-. The name of the product that can dissolve gold is aqua regia, which is Latin for "royal water." It is a mixture of 3 parts HCl to 1 part HNO3 or thereabouts. On the surface, dissolving something valuable seems tantamount to self-sabotage. However, dissolving gold that contains chemical impurities can increase its value because the gold can be reconstituted in a pure elemental form in a number of steps. First the gold is placed in aqua regia until it completely dissolved. Next, a small amount of urea is added along with a precipitant, which causes the dissolved gold to begin forming as a solid again. 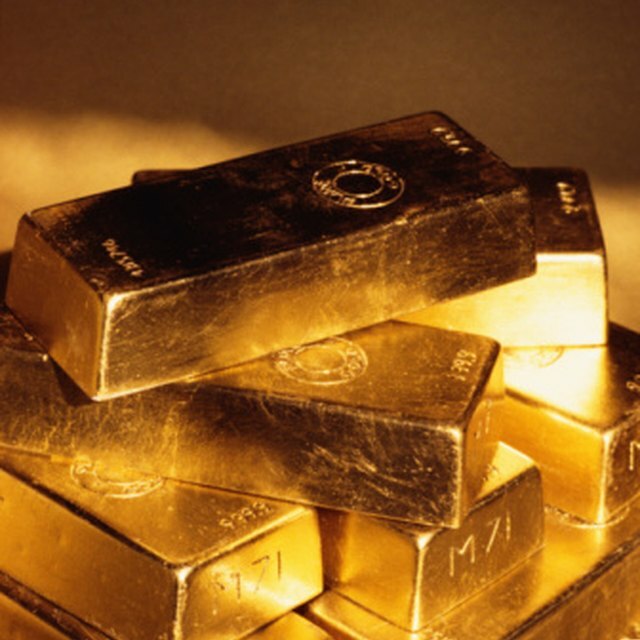 The gold, now free of impurities such as platinum, can be recovered through filtering, rinsing and drying. Two separate reactions take place in the gold-dissolving process. The nitric acid acts as an oxidizing agent, with three molecules of the acid each donating a proton to gold to give it a positive charge of +3. Concurrently, chloride ions resulting from the separation of HCl into its components combine with the newly oxidized gold to form chloraurate ions, or AuCl4-. This provides more unionized gold for the nitric acid to work on, ultimately leading to the dissolution of all gold present. Acids are caustic substances capable of damaging biological tissues, and nitric acid and muriatic acid are both strong acids. Therefore, safety is a vital consideration in the dissolving of gold in this manner. Ideally, the process should be performed outdoors. Any acid spilled on the skin should be washed off immediately using copious amounts of water. Muriatic acid gives off hydrogen chloride gas, which is toxic if breathed in, which is why an outdoor area or other open space is strongly recommended. T., L.. "What Happens When You Put Gold in Muriatic Acid?" Sciencing, https://sciencing.com/happens-put-gold-muriatic-acid-8053326.html. 13 March 2018.